r.futures. * is an implementation of FUTure Urban-Regional Environment Simulation (FUTURES) which is a model for multilevel simulations of emerging urban-rural landscape structure. FUTURES produces regional projections of landscape patterns using coupled submodels that integrate nonstationary drivers of land change: per capita demand (DEMAND submodel), site suitability (POTENTIAL submodel), and the spatial structure of conversion events (PGA submodel). This is FUTURES version 1.0.0, see GitHub repository for installation instructions, citation, and reporting issues. DEMAND estimates the rate of per capita land consumption specific to each subregion. Projections of land consumption are based on extrapolations between historical changes in population and land conversion based on scenarios of future population growth. How to construct the per capita demand relationship for subregions depends on user's preferences and data availability. Land area conversion over time can be derived for the USA, e.g. from National Land Cover Dataset. A possible implementation of the DEMAND submodel is available as module r.futures.demand. 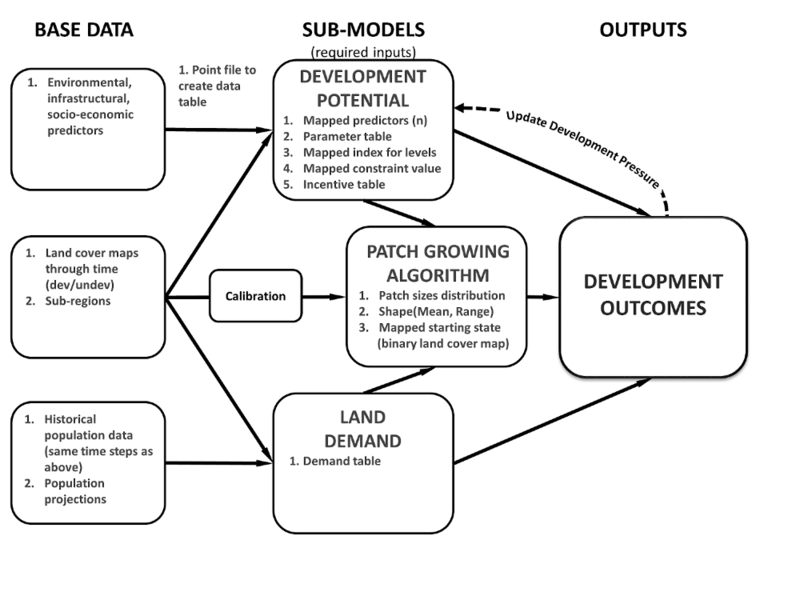 The POTENTIAL submodel uses site suitability modeling approaches to quantify spatial gradients of land development potential. The model uses multilevel logistic regression to account for hierarchical characteristics of the land use system (variation among jurisdictional structures) and account for divergent relationships between predictor and response variables. To generate a binary, developed-undeveloped response variable using a stratified-random sample, see module r.sample.category. The coefficients for the statistical model that are used to calculate the value of development potential can be derived in different ways, one possible implementation using R will be available as module r.futures.potential. One of the predictor variables is development pressure (computed using r.futures.devpressure) which is updated each step and thus creates positive feedback resulting in new development attracting even more development. Patch-Growing Algorithm is a stochastic algorithm, which simulates undeveloped to developed land change by iterative site selection and a contextually aware region growing mechanism. Simulations of change at each time step feed development pressure back to the POTENTIAL submodel, influencing site suitability for the next step. PGA is implemented in r.futures.pga. FUTURES is designed to capture variation across specified subregions within the full study extent. Subregions can be for example counties. DEMAND and POTENTIAL can both be specified according to subregions. 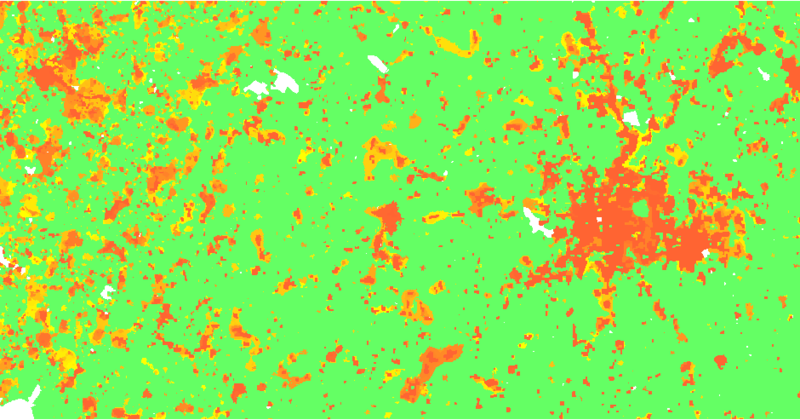 Subregion raster map contains the subregion index for each cell as integer starting from 1. If you do not wish to model by subregion, all values in this map should be 1. DEMAND submodel needs historical population data for each subregion for reference period and population projections for the simulated period. Based on the change in developed cells in the beginning and end of the reference period, and the population data, DEMAND computes how many cells to convert for each region at each time step. Development change is also used for deriving the patch sizes and shape in calibration step (see r.futures.calib) to be used in PGA submodel. DEMAND and PGA require a raster map representing the starting state of the landscape at the beginning of the simulation (developed = 1, available for development = 0, excluded from development as NULLs). The development pressure variable is one of the predictors, but it is recalculated at each time step to allow for positive feedback (new development attracts more development). For computing development pressure, see r.futures.devpressure.